Some 1,800 soldiers from Chad have entered Kidal, the last major town in northern Mali under rebel control, the French military says. French-led forces captured Kidal's airport last week but have not yet secured the town itself. After Islamist fighters fled, separatist Tuareg fighters took control of the town. UN, European and African officials are meeting in Brussels to discuss how to finance and organise rebuilding Mali. One question is how to hold elections, which have been set for 31 July. French special forces have had control of Kidal airport for several days. It is no surprise that Chadian troops were used to help retake Kidal, the last major town held by the Islamists, and a key objective. Battle-hardened and used to desert conditions, the Chadians are not part of the West African force that has been gathering in southern Mali to support the government army. The Chadians are, rather, directly backing their French allies. The two armies have worked together before: France has a permanent military base in Chad, from which it is flying Mirage fighter jets to attack Islamist targets north of Kidal. The French defence ministry said its warplanes had recently hit what it called Islamist "training and logistical bases" in the mountainous areas of Ageulhok and Tessalit near the border with Algeria. It has been about two weeks since the French took control of the other two main towns in northern Mali - Timbuktu and Gao. It appears that Kidal may have taken longer because it is the power centre of the ethnic Tuaregs who started the rebellion in the north last year before it was hijacked by the Islamists. The Tuareg National Movement for the Liberation of Azawad has now tried to distance itself from the Islamist groups. It is believed the French may have done a deal with them, so postponing till now the military occupation of Kidal by the French and Chadian armies. But the Tuareg rebels did not want Mali's army, which has been fighting alongside the French forces, to enter Kidal - accusing its soldiers of killing Tuareg civilians in other towns they have recaptured with France's help. The French intervened in January, fearing that al-Qaeda-linked militants who had controlled Mali's vast north since April 2012 were about to advance on the capital, Bamako. 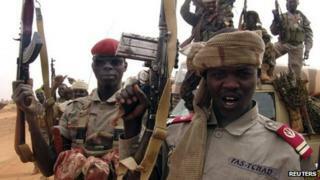 The French-led forces recaptured the other main town in northern Mali, Timbuktu and Gao, without a fight. Islamist fighters are believed to have fled into the mountains around Kidal, near the Algerian border, where French forces have been carrying out air strikes against them. Correspondents say the rapid progress of the French-led force has put the diplomatic focus on how to ensure lasting security in Mali. "The threat concerns all civilised countries," AFP news agency quotes Mali's Foreign Minister Tieman Coulibaly as saying as he arrived for the international support group for Mali in Brussels on Tuesday. "The entire world must gather around us to chase the jihadists from our soil," he said. Before the meeting began, one senior EU official told Reuters news agency: "When a state falls apart, it takes a while to put it back together again. Nevertheless, we need to try. "In the medium term, we need to look at ensuring the north has adequate funds for development so the communities there can build real livelihoods," the official added. The meeting will also look at how to fund, equip and train an 8,000-strong African force, which has UN and US backing, expected to eventually take over from the 3,500 French troops currently in Mali. The EU aims to send about 500 military trainers to Mali by the middle of this month. Several hundred troops from Niger and other African countries have also begun to arrive to secure southern and central regions. Funding for humanitarian aid will also be debated in Brussels. Aid agencies warn that food and fuel supplies to some parts of northern Mali are starting to dry up. About 45 delegations are expected at the Brussels meeting including international lenders such as the World Bank and the African Development Bank. EU foreign ministers have already agreed to resume sending aid to Mali gradually, having suspended it after the March 2012 coup, which allowed the rebels to seize the north.